Citizens of the World Wide Web, I am excited. No, wait. I am ecstatic. Stoked. Amped. Currently displaying the side effects of excessive-caffeination (due, only in part to this Venti Mocha Frappuccino.) Why, you might ask? Because the other day, I received this in the mail. 2. I love people to know things about me. So if the envelope wasn't riveting enough, I couldn't wait to see the letter. And it did not disappoint. Now, am I sad that it wasn't addressed to me directly? Yes. But that's just because the government doesn't know me YET. This will all change in, "about one week from now." I'll be honest, I really don't much care about funding for schools and health facilities that me, and my neighbors, apparently need. I'm way over that. I'm down for some highway repairs though, because for real, 880 is horrendous. Also, I'm hoping there is a short answer section on the Census form, because I definitely have some suggestions for the United States. I'll be greatly disappointed if the entire form is multiple choice and fill in the blank. The one other bummer about this letter is who signed it. 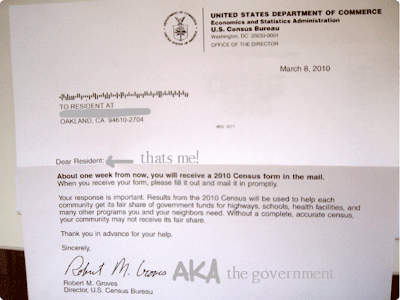 When it comes to something as monumental as the 2010 US Census, I thought it should be sent from someone with some power. A name that can stand on it's own. or the ever-impressive: Sincerely, Batman. Author's Note: I am fully aware that Batman was a vigilante and would, in all reality, never be in charge of a nation-wide citizen count - but how freaking cool would it be to get a letter from Batman? Seriously. SERIOUSLY. But no, sadly, my letter, as well as the letters of several other residents of the Oakland/Piedmont area, were sent from Robert M. Groves. Who the hell is that? I mean really. I don't care about you, Mr. Groves. Your name resonates no fear, no awe. Nothing. So I changed my letter. My letter came from "the government." And I cannot wait to receive more government issued mail. Bring it on, United States of America, bring. it. on. 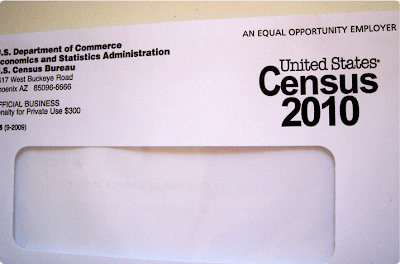 Did you also get a letter telling you you'd be receiving your census soon? Because that's all we've received thus far. It was kind of a downer to open up the envelope the said 2010 Census only for it to be a letter tell us the actual census would be here in about a week or so. wait... wasn't "Groves" the name of our first High School principal BEFORE Huff Daddy moved up? THAT would be cool! if everyone got a census letter from THEIR high school principal!